Good evening, lovelies! Did you have a wonderful weekend? I certainly did, working on a quick project that had me posing in front of ye olde bookshelf again. After seeing all the adorable versions of Colette's latest free pattern, the Sorbetto blouse, I decided to whip up one of my own. Despite the simplicity of the blouse - with only two darts, one box pleat, and no closures - there were a few new techniques for me in this project. First off, the pattern is online, instead of in a traditional envelope, which means: printing, cutting, and taping the thing together. Not going to lie, I've put off Burdastyle patterns in an effort to avoid this situation exactly. The whole idea of piecing and taping dozens of computer pages sounded horrid. The Sorbetto and its cuteness won me over, however, and - surprise! - I didn't mind these steps at all. Maybe it was due to the number of pages, only 15 in all, but it took me just 30 minutes to assemble the pattern. Not bad at all, especially when the outcome is so lovely! The two other new techniques both involved the bias tape finish. Not only did I try exposed bias facings for the first time, but I made my own bias tape, as well. Fancy, non? Even better, it was a total breeze. Using Sarai's tutorial on continuous bias tape, a Simplicity bias tape tool, and my trusty iron, I used a bit of my extra fabric to make the bindings. Y'all, I think I'm addicted. I can't imagine using facings ever again. Why would I, when I can make my own matching bias tape? As an extra finishing touch, I also added fabric-covered buttons down the box pleat. In a coordinating cardinal red, they really set off the floral lawn I used. I'm a total sucker for buttons, even of the unusable variety. 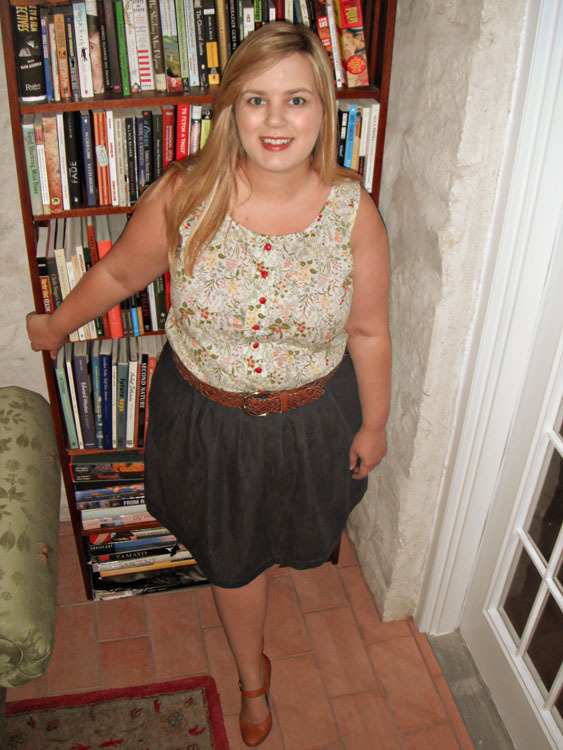 Buttons and bias tape and pleats, oh my! 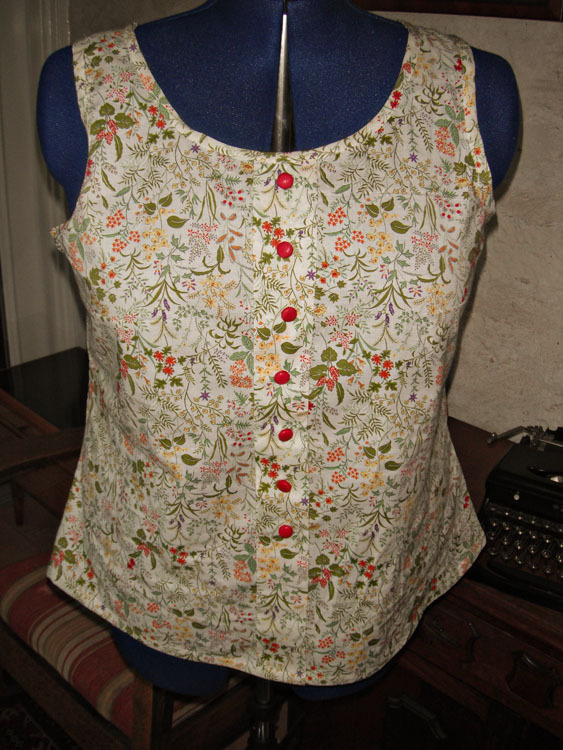 When it comes to the blouse itself, this is another winning Colette pattern. Despite not having sewn any up until now, I'm a rabid fan of tank tops. If I were to have a uniform, it would consist ofvery feminine tank tops, paired with cardigans and full skirts. After sewing up the Sorbetto, I may have even more uniform options - there are so many possibilities for this pattern. I also have a dozen two-yard cuts of shirting just waiting to be made into embellished little tops. If the delightful Mena has seven Sorbettos, we all should, don't you think? The Pleat! Aren't box pleats divine? I love interesting details on blouses and this is an especially lovely one. Every tank top needs such style. The Fabric Usage! Even with the extra length I added, this blouse used less than two yards of fabric. If you have a petite torso, or like your blouses a little shorter, the 1 1/2 prescribed yards would be perfectly right. With such scanty fabric requirements, it's hard not to want this shirt in fine silks, isn't it? The Exposed Bias Facing! I've already raved about this detail, but it's truly lovely. Not only does it give a clean finish, but a cute one, as well. Added three inches of length. At 5'8'', I tend to find Colette's blouses to be a bit on the short side for me. I tissue fit the Sorbetto and then added length accordingly. The blouse now hits me just right, in line with my hips. 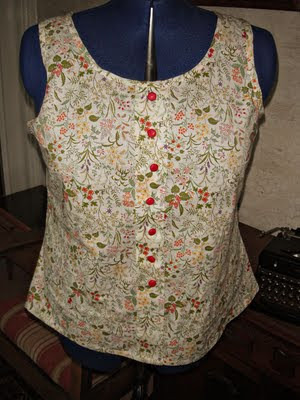 Added fabric-covered buttons as embellishment. I've been studying my favorite RTW styles lately, focusing on the details that make me fall in love with pieces. Embellishment was a big theme among these, which has led me to the decision to add more of it in my own sewing. Buttons certainly fit the bill...and I love them. Vary up the embellishments. I do plan on making this shirt a few more times, but plan on spicing it up with pintucks, piping, lace, and other finishing techniques. This is such an easy pattern to not only sew, but alter to your heart's content. Not a single tricky step in the bunch! Such good news, no? Cream floral lawn from the Moda Regent Street collection. Purchased for $12/yard. Note: I love this fabric. I own two other lawns from this collection, each equally delightful. The prints are classic and the fabric quality reminiscent of the best Liberty lawns. My new Sorbetto blouse, as modeled by my new best friend, Hedy the Dress Form. Note: my hem and buttons are, in fact, straight, despite what this picture would maliciously have you believe. Oh it turned out beautiful, Mary! Just be warned, those Sorbettos are so damn addictive! If you're going to make a lot of bias... you must get one of the bigger Simplicity bias tape machines. I LOVE mine!!! ... and you'll love my method for making bias tape... which is much easier than piecing all those strips. That's a nice version. The lawn is perfect for this top. I agree, after I made my first one, I could make a closet full of Sorbettos? So pretty. And so nice to see you blogging again, you always make such nice things. Cute, cute, cute!! It looks fabulous on you!